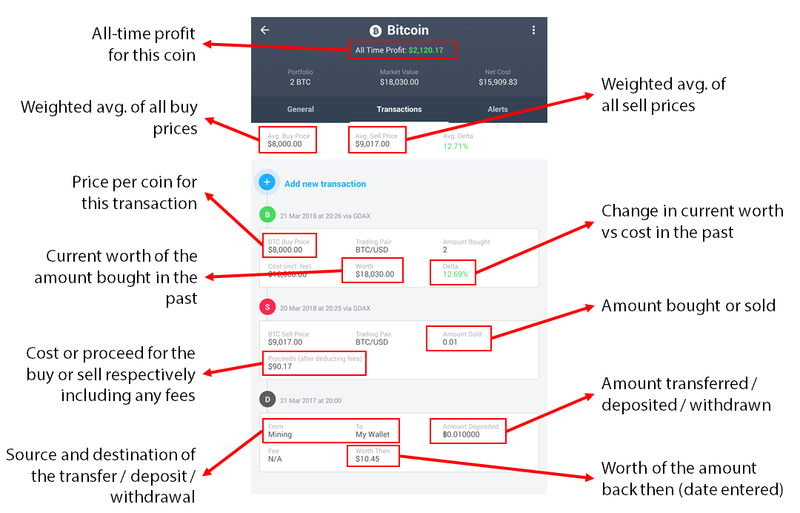 What do all the numbers mean in a coin's transaction screen? Let's take an example here of Ethereum (ETH). If I have selected GDAX as the source exchange and ETH/BTC as the source pair, BTC is the base pair here. The price per coin i.e. ETH/BTC is taken directly from the exchange. If in USD view mode, it is converted using the same exchange's BTC/USD or BTC/USDT rate to calculate the price per coin in USD. If an exchange doesn't have a BTC/USD(T) pair, then we use the rate from coinmarketcap.com. Here is how to change the source exchange and pair. Price is taken as directly entered by the user in the transaction. If the price is in BTC or ETH, it is converted to USD (or fiat) using the BTC/USD(T) or ETH/USD(T) from the same exchange if it's available or the BTC/USD or ETH/USD rate from coinmarketcap.com from the date and time mentioned for the transaction. Note: Avg. Delta does not have any significance. It is simply a statistic.